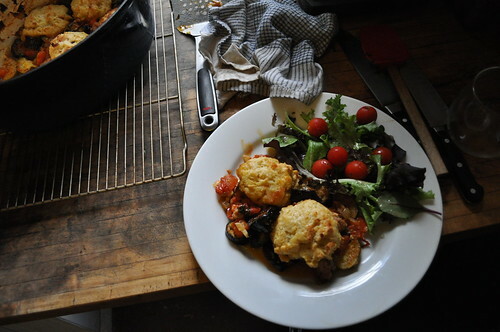 Just out of the oven and still eating, Ratatouille and Sausage Potpie With Cornmeal Biscuits. 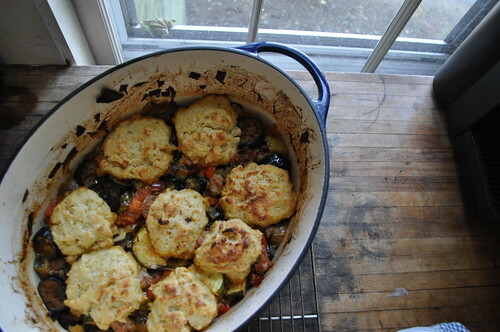 Discovered via the NYT’s Dining & Wine article, Ripe for Autumn’s Hearth. 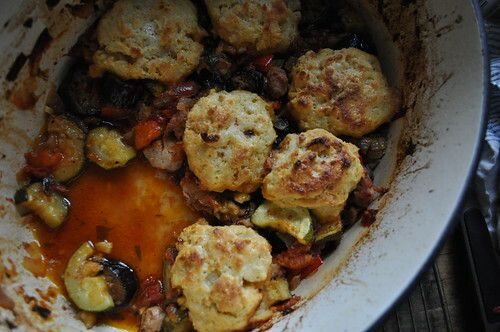 I used tomatoes from my garden, eggplant and zucchini from my weekly farm box. Totally delicious. Make it this weekend and enjoy the last bits of summer. Chicken pot pie tonight sounds perfect! Husband and I just got back from a cute, but expensive hole in the wall Italian restaurant in our Upper West Side ‘hood. Kind wish we had cooked dinner together and enjoyed relaxing! How did the pie w/out the homemade crust turn out? Did you use Pillsbury? I did this too, and just loved it. I can’t wait to make it again. Woops. I misspelled your name. Sorry, Katy! Katie, in Deborah Madison’s Local Flavors, there’s a fantastic recipe for “A Rough and Ready Turnip Potage.” It’s simple — 6 leeks, 3 Yukon Golds and 6 small turnips. Slice the leeks, chop the rest. Melt 1.5 T unsalted butter in a soup pot, stir in the vegetables and give them a toss in the butter, then add 1/2 cup water and a few sprigs of thyme. Simmer 5 min. Add 5 cups water (I use stock for more depth) and 1.5 tsp sea salt. Bring to boil then simmer half an hour. Season with pepper and stir in some cream (I use about a 1/2 cup per pot). She suggests parsley on top. My tweaks: I grate nutmeg into this before simmering. I puree it with my immersion blender. I have added greens at times. Some of my gang likes to spike it with a few drops of Cholula or Tabasco. I serve it with tiny cubes of sharp white cheddar for stirring into it at the table. Seriously good on a chilly day. lol Lynne. I aim to please. I’m glad everyone loved the recipe! I’m on the hunt for a healthy potato leek soup for this week’s recipe. Oooooh, I made this last night and it was deeeelicious! My husband asked me “put it in the rotation.” Which is high praise indeed! I enjoy your blog very much, btw! Awesome Wendy. It’s a great recipe. I think I’ll have it again tonight:) Thank You for the post!!! I’ll be making this for sunday dinner. Yum. Mmm, that looks delicious. Thanks for sharing the recipe!